The advancement of African American youth in America who are at-risk of failure and living in poverty is a national crisis that is often ignored and one that will require a united commitment to resolve. Black youth throughout America are being challenged by issues in their schools and neighborhoods involving gang behavior, drug dealers, crime, teenage pregnancies, unemployed parents, dysfunctional families, and homelessness. These issues make it extremely difficult for black youth to focus while in school and at home. Until all the above-mentioned problems are eradicated, black youth will continue to struggle to remain safe in their environment, to avoid being dependent on welfare, and to achieve academic standards. The challenge to help African American youth to reach their full potential needs to be community-wide and shared by a variety of stakeholders. Teachers, school administrators, parents and guardians, ministers, employers, youth leaders, law enforcement agencies, and civic leaders need to join and embrace a nationwide effort to help build stronger, safer neighborhoods where African American youth are challenged to develop the skills necessary to achieve greater academic, personal, and career success. Individuals and organizations in positions of prominence should provide support by guiding and mentoring black youth to take control of their own destiny to gain their human rights and greater dignity. Successful African American adults must come forward and demonstrate a willingness to accept responsibility and assume an important role in guiding young blacks to accept the challenge to be life ready. By doing so, black leaders will be joining and collaborating to facilitate positive changes in the lives of youths living within their communities. Too many of our nation’s black youth are failing to achieve their full academic and career potential and become underachieving adults. Although federal and state efforts have improved high school graduation rates for African Americans since the early 90’s, these rates are still too low. According to Education Weeks annual Diplomas Count publication, there is some evidence of improvement as the nationwide average of African American students graduating high school at 71% is a significant increase from 25 years ago. However, having 29 out of every 100 African American teens deciding to drop out of high school or graduate without being college or career ready is not acceptable and signifies that there is much more room for improvement. Ensuring that America’s African American youth reach their full academic and career potential is a complex problem. If there was an easy solution it would have been solved already. Although educational leaders have correctly focused attention on the need to improve academic standards nationwide, solving this crisis and improving the fate of African American youth will require a team approach focused on creating school-and-community-wide cultures where more black teens commit to achieving success. America’s black teenagers are being asked and expected to make important decisions regarding their education, fields of study, and career choices. In addition, important choices must be made dealing with personal relationships, future living and work environments, health and wellness, and leisure activities. For decades, far too many black teens have lacked the knowledge and confidence necessary to make these kinds of decisions that will have a significant impact on the overall quality of their adult lives. By learning early about life’s most impacting decisions and the importance of using an effective decision-making strategy, the more likely favorable outcomes and greater satisfaction and success will be achieved. 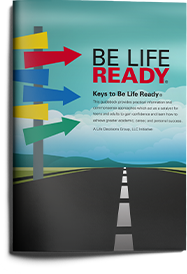 To help educators and other community leaders teach effective decision making and additional life ready skills, Life Decisions Group, LLC created Be Life Ready® as an innovative personal development initiative. Be Life Ready® was developed using commonsense approaches and practical information to serve as a catalyst to inspire all teens, regardless of race or color, to reach their full potential and increase their chances of achieving a more productive, self-sufficient life. The primary purpose of Be Life Ready is to support and help youth succeed by providing immediate access to free online resources. By using the Be Life Ready tools, any individual or community organization can play an important role in challenging African American youth to become better prepared in life. To help with this process, a Be Life Ready Guidebook, PowerPoint, and Facilitator’s Guide are all downloadable at belifeready.com for use by individuals wanting to help themselves, or by others in positions to influence and guide young people to achieve greater success and meaningful, more satisfying lives. By addressing each of these keys starting in middle school every child would be provided with a personalized, comprehensive, developmental approach toward achieving greater success which continues to evolve throughout their high school years and beyond. Broad community support is necessary for any significant advancements of African American youth. Leaders within the black communities need to develop Be Life Ready initiatives to achieve a shared outcome- greater success for youth and for the neighborhoods they reside. Until residents of at-risk communities collaborate and accept responsibility for teaching life ready skills to their youth, they will be fighting a battle they can never win alone. By addressing the Keys to Be Life Ready developed by Life Decisions Group, LLC, the safety and welfare of African American youth, as well as their academic and career accomplishments, will be positively impacted and their potential fully achieved. Be Life Ready® is a registered trademark of Life Decisions Group, LLC. All Rights Reserved. For additional information email, info@lifedecisionsgroup.com.